New Britain, CT. (January 5, 2015) — STANLEY® FATMAX® introduces a new 9” Cast Torpedo Level – model FMHT43610 – and FATMAX® 9” Extruded Torpedo Level – model FMHT42437 – both with new features to enhance visibility and quickly adjust projects to level. The 9” Cast Torpedo Level features rare earth magnets for excellent holding power to steel and other metals. The die-cast aluminum body is slightly heavier than other levels for strength and long tool life. The level also features 180º Rotating Vials for duplicating precise angles such as a roof pitch of plumbers’ drainage lines. The 9” Extruded Torpedo Level features a box-construction design to sit securely on framing. The level also includes both a block plumb and 45 degree vials. The extruded aluminum body offers strength in a lightweight design. Over-molded rubber end caps offer non-marring leveling and shock resistance. On both levels, the block plumb vials are calibrated for accuracy of 0.0005”/in. The levels also feature a magnified center block vial for easy readability, and enlarged vial housing for bright lit vials. 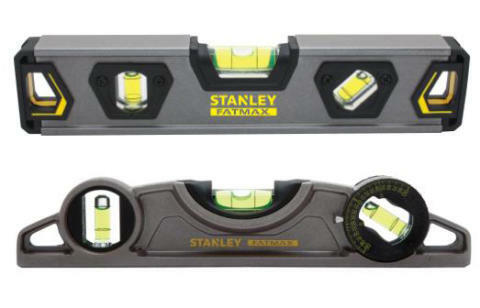 The STANLEY® FATMAX® Levels will be available in December 2014 at mass retailers, home centers, and independent retailers. The 9” Extruded Torpedo Level (FMHT42437) will retail for approximately $16.99. The 9” Cast Torpedo Level (FMHT43610) will retail for approximately $19.99. STANLEY®, a brand of Stanley Black & Decker, Inc. is a diversified worldwide supplier of tools and engineered solutions for professional, industrial, woodworking, construction and do-it-yourself use. For over 170 years, the trusted Stanley® brand has been synonymous with quality, value and reliability. Its well-known hand tool and storage brands include Stanley®, and FatMax®. Headquartered in New Britain, Conn., Stanley Black & Decker, Inc. operates multiple manufacturing facilities and sales offices throughout the globe. For more information, visit www.STANLEYtools.com or follow Stanley on Facebook and Twitter.